I’ve tried to write this story many, many times. I’ve typed, and deleted more times than I can count. It’s hard to share about a time in my life when my thoughts were so dark, my joy completely gone, and my shoulders heavy with burdens. This is a time in my life when I would wake up every single morning with tears in my eyes and panic in my chest. The moment I opened my eyes was the hardest part of my day. The realization that I was going to have to live another dark day was almost more than I could bear. I still have some PTSD from this situation. 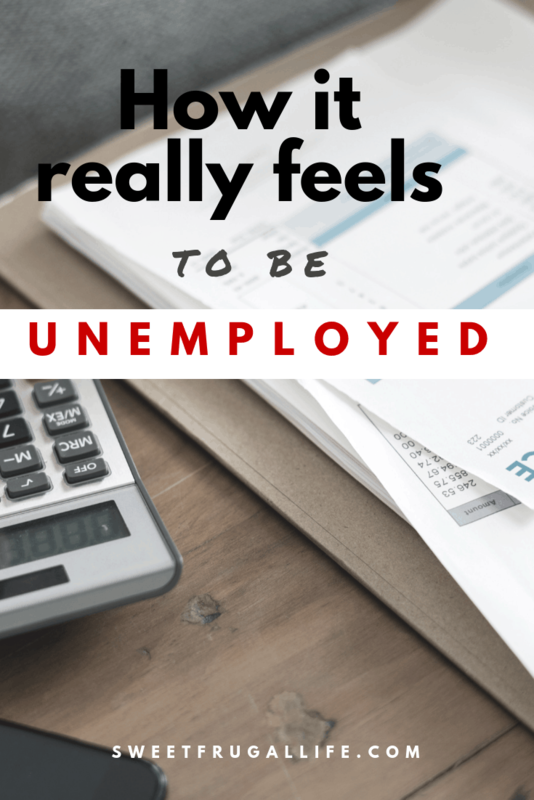 My heart still clenches every time someone says the word “unemployed.” The memories come back into my mind and I am reminded about the pain and stress during this time of my life. It is hard to talk about, hard to relive it all. And, yet, I know that others deal with much worse. This small trial in my life is so small compared to what others go through. I am so embarrassed that I wasn’t able to handle it all with more strength and courage. I am embarrassed that it affected me so deeply and sent me into a dark depression. I am embarrassed that others go through heartache after heartache, burden after burden, all with a smile on their face……and I couldn’t even handle this. It makes me feel weak and full of shame. I wish I would have, could have been stronger and better through it. But, I wasn’t. 4 years ago my husband came home and told me he had lost his job. My world immediately came crashing down on me. I still shed tears every October 8 at 1:36 PM. The moment everything changed. The next 7 months was a nightmare. I found myself checking and rechecking our bank account. Calculating and recalculating how much we spend each month and how much we can cut out. Every penny spent was like a kick in the gut. I found myself worrying about all of the “what ifs.” What if he can’t find another job. What if we have to relocate (for the 4th time!). What if I have to go back to work and leave my favorite job in the world as Stay at Home Mom. What if we will never be able to afford to retire. What if we won’t be able to send our kids to college. What if we have to take my daughters out of gymnastics and piano lessons. What if we can’t afford to buy the kids Christmas presents. What if life will never be the same again. What if we lose everything. I worried about my husband. Worried about his confidence, self-esteem, and pride. I worried about my children. I worried about the stress and burden they would have to feel. I worried about our future, our present, and everything in between. We began conversations about medicaid, unemployment and food stamps. We felt like failures. Failures as parents. Failures as adults. Failures as people. We didn’t want anybody to know. We didn’t want the judgments or the whispers. They all found out……but nobody said anything, and that felt almost worst. Or, there was the family members who planned a family get together that would require everyone to spend a lot of money in order to come. I couldn’t understand how anyone could be so inconsiderate. Do they not realize that we have ZERO money coming in right now and every penny spent feels like we are one step closer to living on the streets? It hurt. It hurt really bad. These are not easy things to admit. I told you that I wasn’t in a good place at this time. A better person would have handled it all better. A better person wouldn’t have gotten so upset…..but I wasn’t that person, and I am ashamed by it. Not everyone was insensitive to our situation. Their was the neighbor that held me for 10 minutes as I cried and cried. My sister who allowed me to vent all of my frustrations day in and day out and never judged or condemned my feelings. My dad who hired my husband for odd jobs and used his personal connections to try to network for us. The many secret envelopes of money that showed up at our doorstep right in time for Christmas. We had many many earthly angels placed in our life at this time. My husband is an amazing man and an extremely hard worker. He immediately updated his resume and spent every single day visiting local businesses, trying to network and make connections. He would call and stay up to date with everywhere he placed his resume. He spent hours browsing the internet looking for any new positions posted. He picked up every side job he could find. He hung Christmas lights, worked for a sod company, stained a pig pen, bottled milk at a dairy plant, and hired himself out as a handy man. We started out with the hope that he would only be out of work for a few weeks. Weeks turned into months. 7 months went by and he began sending his resume further and further away. He had a few interviews. He even had a job offer, which suddenly disappeared one day. And that was my breaking point, the moment I felt as if I had been thrown in a deep dark hole and all hope was lost. He decided to look on Craigslist again (which had always been a dead end in the past). He found a job posting for what looked like the perfect fit. The ironic thing about this posting is that this was the very first business he stopped by that first day of being out of work. They had told him they weren’t hiring. 7 months had changed that. He sent in his resume. Didn’t hear anything. He called them a week later to check up. He was offered an interview. He showed up for the interview the next day and was shocked when he was greeted by two of his good friends from college. They had graduated in the same program together, worked on research projects together, and then had gone their separate ways. That was 10 years ago. These friends vouched for him and were a huge part of him getting this job. The interview went well, but we had gotten our hopes up far to many times and feared another letdown. Three days went by without a word. Again, my husband called to check up on his status. He was offered the job on the spot. This was his dream job. A perfect fit for him and our family. Do you believe in a higher being? Because I do. And, I believe He helped my husband find this job. The friends that were vital to him getting this position, both left the company just two months later. Coincidence? I think not. This all happened as it was suppose to. So that you understand why am I am the way that I am. I am a natural spender. (Read my post A Financial Tale of Two Sisters for more info on that). Before this experience I lived fairly frugal. I didn’t have any debt, I made 80% of our meals at home, and I tried to save a little from each paycheck. Yet, I didn’t stick to a budget. I didn’t blink an eye when I would drop $200 at Target. I impulsed shopped. I bought what I wanted, when I wanted. I used the phrase, “I deserve this, so I will buy it” far more than I would like to admit. I assumed life would always be easy and there was really no reason to worry about money. When we spent these 7 months unemployed and I felt all of the many heartaches and pressures of finances, constantly worrying and wondering if we would have enough to survive; I learned just how important the value of a dollar is. I vowed to never feel that way again. I can’t control whether my husband loses his job again or not. But, I can control my spending and my saving. I realized that when there’s a will, there’s a way. We learned to live life without ever going out to eat. I figured out how to cut my grocery budget (something I had always deemed “impossible” before this). I learned to shop at the thrift store, to use what we already had on hand. I learned to say “no.” I realized just how much unnecessary spending I had been doing, and just how wasteful it all was. I learned that all of my excuses, were just that, excuses. When we absolutely HAD to cut our spending, we DID it! I worried a lot about my kids. I didn’t want them to feel these adult burdens. Immediately after losing his job, my husband and I sat our children down and told them through tears what had happened. We explained to them that things were going to have to change as we needed to be more careful with our money. Our kids cried and cried as we hugged them and told them everything would be ok…..all the while I was secretly wondering, “would it be ok????? About 5 months into unemployment my oldest child announced, “Nothing has really changed! It feels the same as it did before!” I was so relieved to hear her say this. The thing is, everything had changed. I was spending 75% less each month than I had been before. Yet, my kids were obviously not hurting. This taught me that kids do NOT need a lot of money spent on them in order for them to be happy. They were perfectly content with the simple life we had created. This is why I am frugal. This is why I would rather have money in the bank than stuff in my house. Saving money brings me the security and assurance that we will be taken care of if we ever find ourselves in this situation again. I have learned that I can live on MUCH less than I had originally thought. It is not always easy for me to live frugally. I make mistakes, I get lazy. But, when the thoughts and emotions of those horrific 7 months come back to my mind I am reminded that it is ALL worth it! And THIS is why a spender learned to be a saver. THIS is why I live a frugal life. I know exactly how scary that feels! I’ve been laid off twice, the first time was 3 months before our wedding, and the second time when I was 6 months pregnant. At the time my husband and I worked for the same small company and the day I was laid off (2nd time) he was told his department was going to have to take a 20% pay cut…so we lost half of our income in one day. And we had a baby due in 3 months. I was terrified. Then we relocated for my husband’s Inew job and he was laid off from there after a year. He was already interviewing at another place when that happened, and luckily got an offer with better pay and benefits only a week later, so it all worked out. Stressful barely begins to describe the last few years of our life! Oh wow! What a rollercoaster! I’m so sorry you have had to go through that!! Thank you, thank you, thank you! Sending you hugs! For being real, for being honest, thank you. Thank you for sharing. You are not alone. Yes I lost my job too and my job was my Lighthouse. While everything around me swirled or was in chaos my Lighthouse was there. I was good, no actually great at my job and then along came a young executive with different plans and axed me. Yes I went into a deep depression, PTSD. Today I am learning from You, yes You .. Thank you so much for those sweet words! They really mean the world to me!